Several years ago RancherMan bought a martin house as a gift for me, knowing how much I loved birds. He also knew what a challenge it was for me to get any trees to grow in our backyard. We put that martin house on a heavy reinforced triangular telescoping pole. Then we attached it securely to a line post on the fence to our yard. For years I’ve enjoyed watching nests being built and young being raised. And I love the robotic R2-D2 sounds the martins make as they swoop around the yard. But the martin house has certainly had its challenges too. Even though we have that heavy-duty pole, a strong storm laid it over one year. Thankfully only the last foot of the pole was damaged & RancherMan was able to cut that section off. After he righted the martin house again he attached a piece of heavy-gauge wire from the fence to the pole on each side to stabilize it. I was happy that I was once again able to enjoy the purple martins. 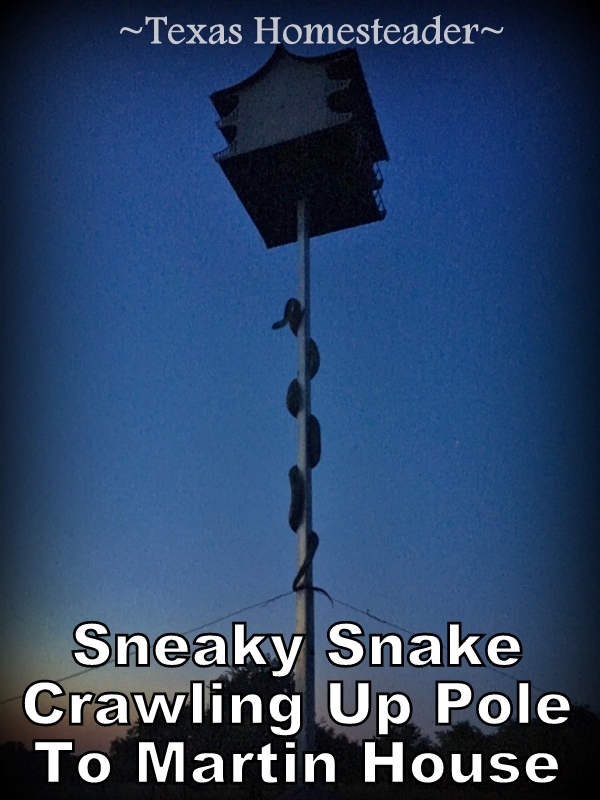 Then we noticed one day that a snake was working its way up the pole. Now I don’t begrudge a snake his meal, he deserves to eat just like any of the more beautiful creatures. And most snakes are very beneficial in keeping down the population of rats & mice. But I really didn’t want to lose my martins since there are other places for those snakes to get their meal. Typically if a snake shows up in an undesirable location we simply relocate him with our extra long *Snake Grabber. It’s easy to safely catch a snake using that grabber. But on this night we noticed as he worked his way up the pole that he lost grip and fell to the ground (first straddling the barbed wire fence – ouch!) 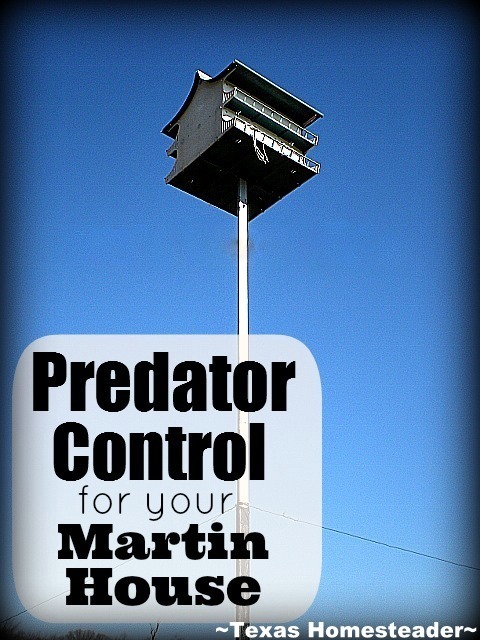 So I assumed my martins were safe from sneaky-snakey predators. It took several weeks before any birds were brave enough to begin building nests in the martin house again. But little by little the house was repopulated. I couldn’t stand the thought of a snake working back up the pole so I asked RancherMan what he thought would be a good predator solution. He took tractor grease & greased about 5 feet of the pole. His thinking was that the snake would be covered in grease and not able to proceed up the pole. Great idea! But one day I noticed there was no activity from the martin house. Upon closer inspection I could see where the snake did indeed slink through that grease. His grease tracks went up the pole to his meal. Once again begging RancherMan for a solution to save my martins he came up with this. 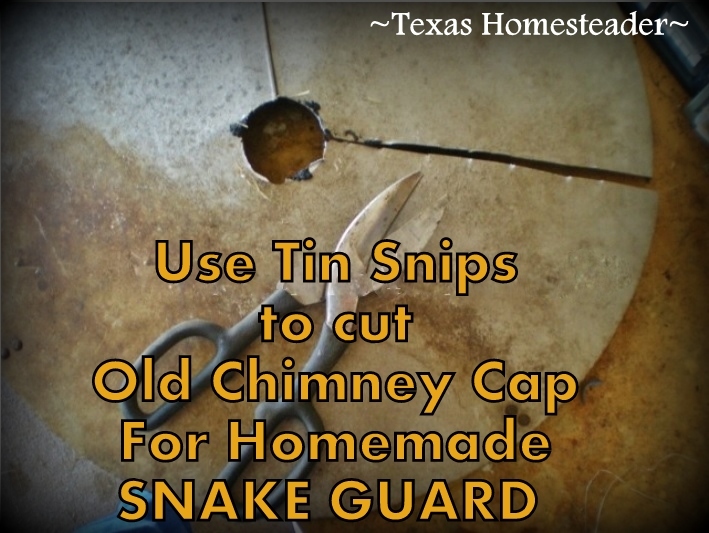 He took an old chimney cap & cut off the domed top. #UseWhatchaGot! He used tin snips to cut a circle out of the center to give the martin house pole a space to go through. He took the piece & wrapped it around the pole about 6 feet off the ground. This basically made an upside down bowl on the pole. Then he attached it to the poles with a couple of screws to hold it all in place. The snake should hit up against this ‘inverted bowl’ as he crawls up the pole. And hopefully he’ll have no way to get around it. We’re betting he won’t be able to get around this upside-down bowl without losing his grip. So far I’ve seen no further evidence of a snake going up the pole. And the martins are once again filling the house’s rooms to capacity. Let’s hope this fixes the problem for good! I love that we were able to use items we had around the ranch to solve a problem. 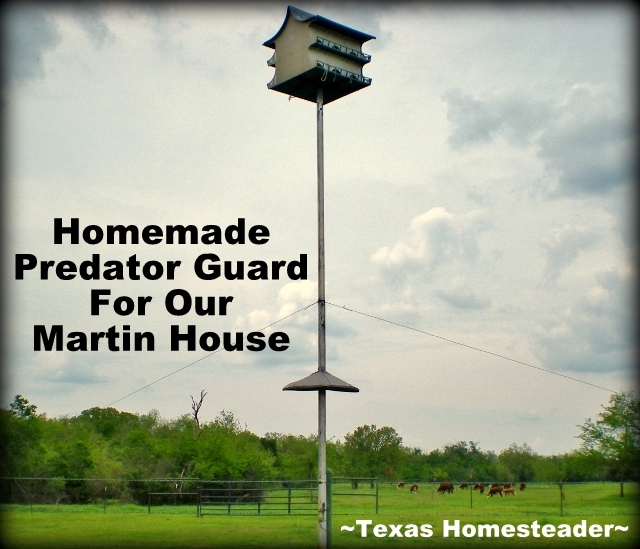 How about you – how do you keep snake predators from your martin house? This entry was posted in Blog Posts and tagged Environment, Frugality, Make-It-Yourself, Spring on April 22, 2014 by Texas Homesteader. Does the stove top inverted bowl stop raccoons? Ugh, poor birds. I would love to have martin house, but my husband thinks they’re messy and invasive. I hope we don’t have any snakes in our backyard, yikes! Thanks for sharing at Thursday Favorite Things. I hope you will join us again next Thursday! We have a couple Martin houses and always a joy seeing them coming around in the Spring. We have no problem with snakes here………….thank goodness. Here are a couple of tips that you may also like to try if people have problems especially with rat snakes who are good at climbing the poles. Try scattering moth balls around the base of the pole All Natural Snake Repellent: Ingredients: Clove oil Cinnamon oil Simply mix a 50:50 mixture of clove and cinnamon oils and spray them around the foundation of your home, dog houses, walkways, garages, doors or anywhere you want to keep snakes away from. Snakes like cover where they can hide and look for prey. Always keep the grass around the martin pole set ups cut short and maintain an open area. Rat snakes may be less inclined to crawl a long distance across an open lawn since such a move exposes them to their night enemies such as barred and great horned owls, and day enemies like red shouldered and red tailed hawks. Keep your houses/gourd clusters away from thickets and brush piles. Don’t plant flowerbeds at the base of the martin house poles or allow vines to climb the poles. I am so glad to see that you have figured out a way to keep those predators away! Thanks for linking got the In and Out of the Kitchen Link Party! So glad you are here! I didn’t even know the martins could be in danger from these. Good to know….and to know how to fix the problem. Our martin house remains down for the last few years….our pine trees and peach tree have grown so fast and so large that the martin house is not isolated anymore and there isn’t another open place that we can figure out….or have time to work on! I would like to get that in use again though….they eat so many mosquitoes and that would be a help to us. Thank you for posting. Hi Taylor. My first time visiting your blog (hopped over from Real Food Fridays). I admire your dedication to keeping the Martins around and not harming the snakes. The most difficult part for me is keeping my dogs from getting the snakes AND birds (unfortunately they love playing with them… and I am forced to keep rescuing them…). I was wondering about the tree issues you’re having. I’m not sure why the trees haven’t grown so far, but I wanted to recommend looking into planting some into a mini hugelkultur bed (http://www.richsoil.com/hugelkultur/) if you haven’t tried it already. People have regrown vegetation in desserts using those raised beds, and your backyard looks a lot more green-friendly than that, so maybe it’ll work ;). That’s a great solution. We aren’t fortunate to have martins around here. Thanks for sharing this great post today on The Maple Hill Hop! Great solution! I would have never guessed a snake would go up the pole in the first place! And then to make it past the grease? Determined little rascal for sure! Hope the birds are protected now! Enjoy your view!